(any website or other seller which talks about AAAA+++ grade pearls is talking rubbish and this should be challenged). 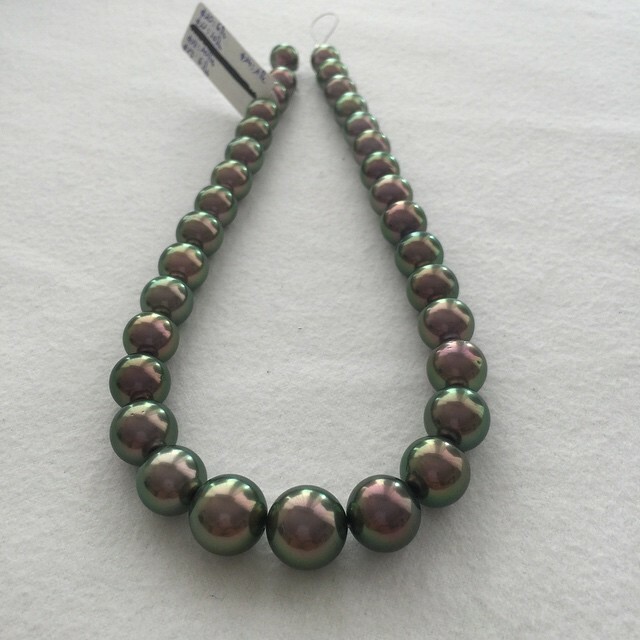 Tahitian pearls have a distinct and separate system, established by GIE Perles de Tahiti, and the Ministere de la Perliculture of Tahiti which grades from A (finest) to D ( poor) but to avoid confusion Pearlescence uses only the A-AAA gradings throughout the website. Research and new farming for abalone pearls has started in New Zealand in the last few years..
Akoya pearls come from the akoya oyster (Pinctada Fucata Martensii), which is the smallest pearl producing oyster (6cm to 8cm). 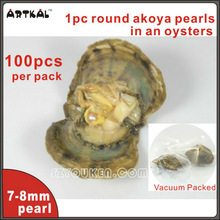 This is why akoya pearls over 10mm are very rare while the normal size is about 6mm to 7mm It is a salt water mollusc. Most cultured sea pearls are akoya pearls which are made with a bead nucleus, so that they usually have a good round shape. Big irregularities tend to be tails while less than perfect pearls have nacre with pits or convolutions. Good akoya pearls have a sharply reflective metallic lustre. 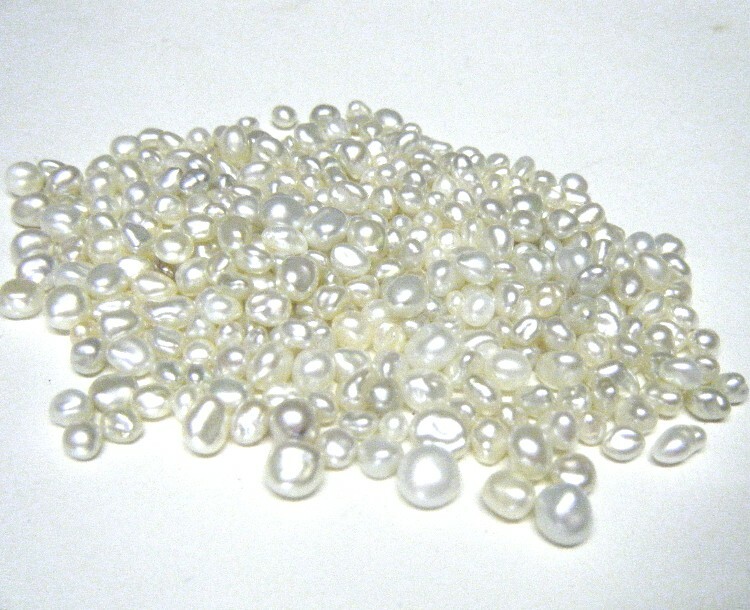 Most akoya pearls come from Japan with a small production in China. Akoya pearls are harvested after only 9-16 months. The main thing to be aware of is that akoya pearls which are too cheap can have only the thinnest layer of nacre. Pearls with very thin nacre may even ‘blink’ which means that when rolled the nacre blinks to show patches where there is no nacre and you can see the nucleus. Below is a very bad example – the cream colour is nacre and the white is nucleus. Even when the nacre appears solid it can be very thin: peer closely and you can just about make out the thin line of the black nacre on the akoya pearl on the left (which split in half) The nacre on the pearl on the right is so thin the pearl is a ‘blinker’ . 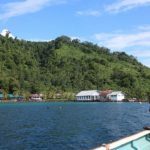 This entry was posted in Pearl A to Z and tagged a -aaa pearl grading, abalone, akoya, all you need to know about pearls, pearl, pearl education, pearl information, pearl knowledge, pearls on October 18, 2018 by WendyG. Baroque pearls are strictly all non-round pearls but the term is usually applied to pearls which are not round but which nevertheless have a good rounded surface all over. Freshwater pearls are most commonly baroque as freshwater pearls are mantle-tissue nucleated instead of bead nucleated. 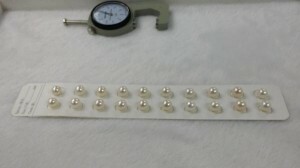 So round pearls are the exception, although more are being produced as techniques improve. The most valuable baroque pearls are South Sea and Tahitian pearls which are produced by Blacklipped and White-lipped oysters (Pinctada margaritifera, and the Pinctada maxima). Commercial baroque pearls tend to be bigger pearls – there is a balancing act for the pearl farmer between leaving the pearl in the mollusc with the chance of a big round pearl and the likelihood that the pearl will go out of round and become baroque and therefore less valuable – but for the buyer, you will be getting a lot of nacre for your money. Nucleation is the process which starts off the growth of a cultured or farmed pearl. It involves inserting something into a nacre-producing mollusc to trigger production of a pearl. This nucleus can be either just a tiny sliver of mantle tissue on its own or a sliver of mantle tissue plus a bead or other shaped foundation. In either case a nacre secreting pearl sac grows and a pearl is made within that sac. Bead nucleated pearls include all Tahitian and south sea pearls, akoya pearls and many modern big freshwater pearls (brands Edison and Ming – see separate entry under Edison)) as well as fancy shapes such as coins or hearts. Keishi pearls are an exception. They are the pearls formed inside a usually pre-existing pearl sac from which a pearl has been removed (think of how a balloon looks when the air seeps out over time and you get the idea of a keishi pearl. Mantle tissue is used because that is the area of tissue which specifically secretes nacre. It’s usually there to make the mollusc’s shell but will produce nacre wherever it is – a talent utilised by the pearl farmer. 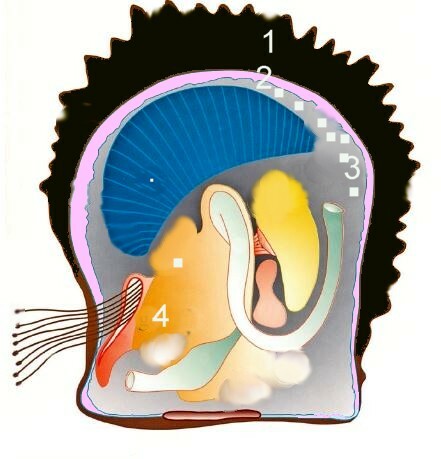 Tissue nucleated pearl grafts can be many to a mollusc and are placed in the mantle. All sea pearls are grown around a bead. It used to be that beads were not used in the production of most freshwater pearls (exceptions include coin pearls for example) However the last couple of years have seen the development of bead nucleation in freshwater pearls, producing second or third graft round pearls of stunning colour, lustre and shape. 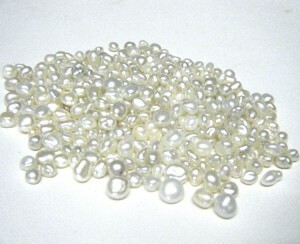 High quality bead ‘nuked’ pearls are still exceptional and unusual and therefore very expensive, but can be up to 18mm. Stick pearls are often generically mis-described as biwa pearls. They aren’t. Pinctada margaritifera This oyster produces the Tahitian black pearl, which is neither black, nor comes from Tahiti. Term to describe poor quality bead nucleated pearls where the nacre does not even fully cover the nucleus. When the strand is rolled the pearls look as if they are blinking. Beware of akoya pearls which are cheap. They will almost certainly have very thin nacre which will wear through. A pearl that is attached to the inner surface of a mollusc shell. Often rounded on one side and flat on the other. Sometimes also called a fastener pearl . Most often used to make stud earrings, because in larger sizes round pearls can be too proud of the earlobe. This entry was posted in Pearl A to Z and tagged a-z of pearls, all about pearls, b, baroque, bead nucleated, biwi, black lipped oyster, blister, button, pearl, pearl information biwa, pearls on October 18, 2018 by WendyG. Nearly every pearl available anywhere in the world is farmed – cultured. Pearl farms tend to be stunningly beautiful places. A false pearl bead manufactured by coating the inside of a hollow glass sphere or the outside of a solid glass or plastic sphere with a pearlescent coating which is sometimes pearl powder. Faux is a fancy word for fake. Also called shell pearls. They are of course perfectly round in shape, with great lustre and even colour. 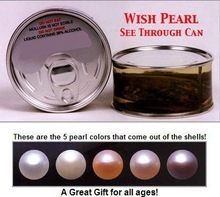 White shell pearls are very white, which is a give-away. All fake pearls feel smooth when rubbed on the teeth and the drill holes tend to be larger. A pearl grown in a freshwater river, lake or pond margaritifera mollusc. Often more irregular in shape and more varied in colour than salt water pearls freshwater molluscs are nucleated by creating a small incision in the fleshy mantle tissue and inserting a piece of mantle tissue from another mussel. This process may be completed 25 times on either side of the mantle, producing up to 50 pearls at a time. The molluscs are then returned to their freshwater environment where they are tended for 2-6 years. The resulting pearls are of solid nacre, but without a bead nucleus to guide the growth process, the pearls are rarely round. This entry was posted in Pearl A to Z and tagged faux pearl, fiji pearls, freshwater pearls, gold south sea pearls, kamoka, pearl, pearl farm, tahitian, talesei, white south sea on October 18, 2018 by WendyG. Gamma irradiation turns the nacre of freshwater pearls very dark, and often also imbues a metallic lustre with rainbow orient. 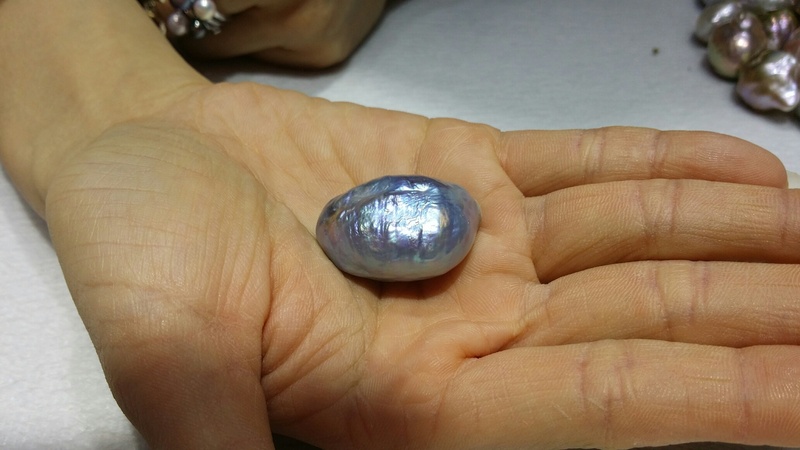 Strangely, it has no effect on salt water nacre but will turn the nucleus dark which shows through the layer of nacre, making the pearl look grey or blueish There is no danger of radiation contamination from irradiated pearls. or popcorn pearls have a knobbly surface which resembles..popcorn. This granulation is often mixed with patches of high lustre surface. When the Chinese freshwater pearl business was starting up most of the pearls were, at least to some degree, popcornish and oval in shape. 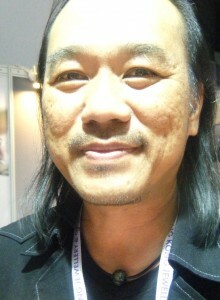 Term also used for the earliest Chinese freshwater pearls which were called Rice Krispie pearls. This is the name we give to the extremely beautiful lustrous gold pearls which are natural pearls with a layer of aragonite with an incredible lustre – so it does indeed look as if a layer of gold leaf has been applied to the pearls. A large oyster (variety of Pinctada maxima) used in some countries to produce South Sea cultured pearls; it produces a yellowi nacre, and pearls that typically range from off-white to rich, deep gold in colour. This entry was posted in Pearl A to Z and tagged a-z of pearls, colour change pearls, gamma radiation, gold leaf pearls, gold lipped oyster, granulated pearls, pearl, pearl education, pearl information, pearls, pinctada maxima.Goniochromism, rosebud pearls on October 18, 2018 by WendyG. Knots in the silk between pearls is a sign of quality in pearls. If there are no knots or the pearls are on beading wire and look stiff and without movement then they are not being assembled to show their best. The knots serve two purposes. Firstly the chances of losing all the pearls is minimised, only one or two maximum can be lost (Pearlescence always gets really annoyed at the scene in ‘Murder is Announced’ where the pearl necklace breaks and all the pearls shower onto the floor. Good for Miss Marple but very bad for pearls). Secondly each knot acts as a hinge allowing the necklace or bracelet to flex. They stop the individual pearls packing closely. Never get pearls strung onto real silk wet – this is not because the pearls will be harmed, it is very unlikely that just getting wet with water (either salt, fresh or swimming pool) will damage pearls after all, but the silk on which they are strung will rot in time especially the silk inside each pearl which is trapped and therefore takes much longer to dry. Please do wear your pearls all the time. Pearls need light oils to look their best and the oil in human skin is perfect. If you absolutely must wear your pearls in water then please let us know and we can re-string them on a very strong and water resistant synthetic silk substitute. Play between the pearl and the knots. This is a sign that the silk may be stretching and it might be time to start thinking about getting them re-strung. We are happy to re-string pearls and will restring our own pearls at a reduced rate. strung unknotted onto silk and the lower has been knotted. This entry was posted in Pearl A to Z and tagged a-z, kasumi, Kasumi-ga-Ura, keishi pearls, knots, pearl, pearl information, pearls on October 18, 2018 by WendyG. 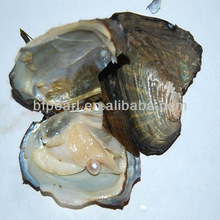 are produced by the black-lipped oyster (Pinctada margaritifera). They have been produced for almost exactly 50 years now in French Polynesia, in the lagoons of remote coral atolls and islands – everywhere except on Tahiti Itself! Black Lip Oysters are now also being farmed in a small way in Australia. The oyster itself is quite large — sometimes up to 12 inches across and weighing as much as 10 pounds — which often results in much larger-than-average pearls. The pearls are unique because of their natural dark colours. Most “black” Tahitian pearls are not actually black, but are instead grey, silver, charcoal,chocolate brown, blue, purple, aubergine, pink, beige or even off-white Truly black pearls are extremely rare. Sometimes molluscs yield pearls of such quality that farmers put them back in the water for a third time. Third graft pearls will be very large indeed, and the mollusc could be ten years old. This entry was posted in Pearl A to Z and tagged black lip oyster, black pearl, french polynesia, kamoka, pearl, pearl education, pearls, tahitian pearl, third graft pearls. top drilled pearlsPinctada margaritifera on October 18, 2018 by WendyG. Confirmation that prices for the best pearls are rising comes from the prestigious JCK magazine, which features quotes from my pearl friend Jack Lynch, of Sea Hunt pearls. 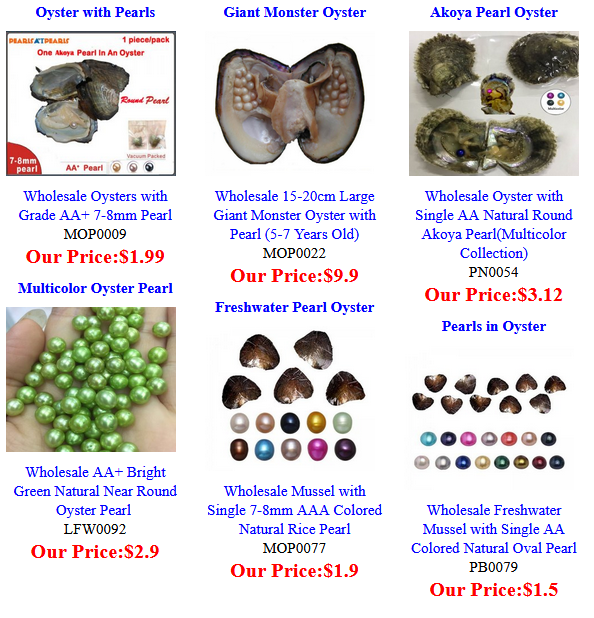 This entry was posted in World of Pearls and tagged jack lynch, pearl, pearl market, pearls, prices rising on November 3, 2015 by WendyG. A whole new feature on the website just went live. Code name Santa search It’s the new easy-peasy gift finder search program I thought up a couple of weeks ago and which our amazing webmaster Neil has constructed so that it has come out exactly as I thought up. The whole idea is to make it easy for people who are confused by the full website to have just one or two choices of pearl colour and price range. They can pick one of the suggestions or then follow it up with either phone or email if they don’t see what they want or like and we can take it from there. Hopefully this will make it much easier for those who are daunted by choice! This entry was posted in Pearlescencery and tagged gift finder, pearl, pearlescence, pearls on October 28, 2015 by WendyG. .Yesterday and Friday the Worshipful Company of Goldsmiths and the London Assay Office held an event for UK jewellery students to learn about all sorts of businesses which support and supply their crafts and skills, from all about hallmarking itself to……pearls………..US! 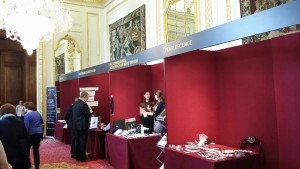 Over the two days we’ve talked ourselves hoarse about pearls (my voice has dropped about an octave at least!) with students and with some of the leaders of the jewellery business in the country. I don’t know if I wasn’t more excited than many of the students at who was there and who we met. Pretty soon the students start to flood in and immediately home in on the fireballs I’ve brought. My aim in choosing what to bring was to keep it pared down and show that there is so much more to pearls than white and round and the fireballs and big ripples I selected start their job immediately. By the end of the two days I think I explained how fireballs happen at least once per hour! The students love them, and fireballs. I did several knotting demonstrations as well during the two days. By the last one my co-ordination had gone completely and I got knots! Special thanks to @stevelao and Alison of the assay office, plus to the wonderful, unfailingly helpful, knowledgeable and friendly Goldsmiths’ Company and London Assay Office staff. 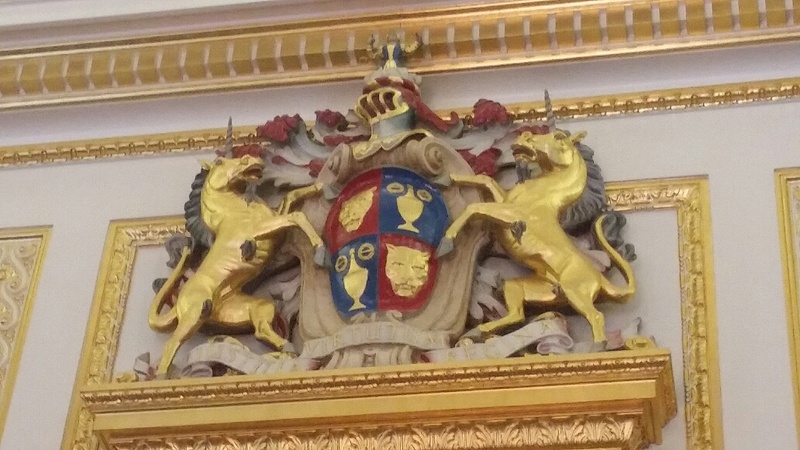 Most memorable moment…Looking at the panels on the wall listing the Masters of the Worshipful Company of Goldsmiths dating back to 1317 and realising that I’m standing right there – by invitation! 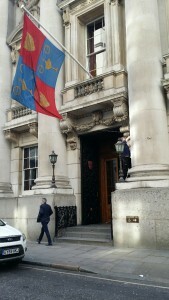 This entry was posted in Pearlescencery and tagged goldsmiths hall. worshipful company of goldsmiths, london assay office, make your mark, pearl, pearlescence, pearls on April 19, 2015 by WendyG. First is a necklace of perfect archetypical peacock Tahitians from one of the world’s biggest wholesalers of Tahitians, Wiart Loic. The green body colour and aubergine ‘eye on each huge perfectly round tahitian is …….oh…….perfection. 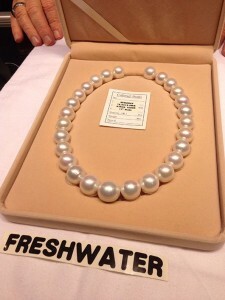 Second, this necklace of huge white round pearls is made up of freshwater pearls..yes, really, freshwater pearls. It comes from lovely Jack Lynch of Sea Hunt Pearls. He’s the man who coined the name ‘souffle’ for the huge hollow pearls. 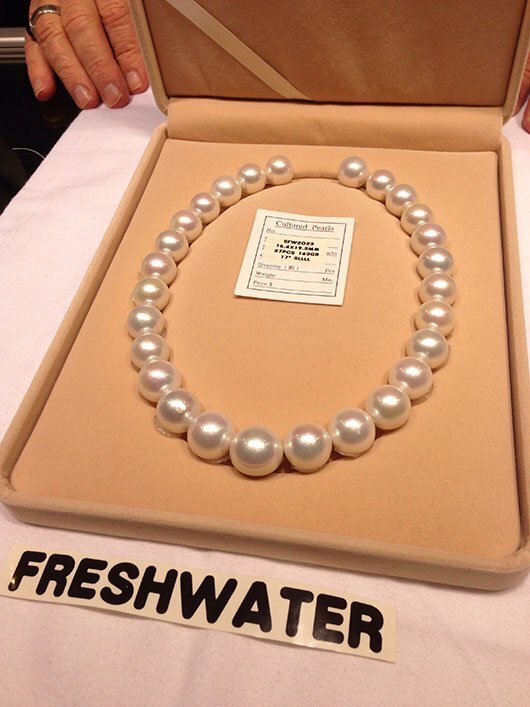 The pearls are 15.4mm to 19.3mm and would have been yours for a modest $20k, if you had got to him before his buyer..but it does go to show that fabulous freshwater pearls are just as much fabulous pearls as their equally bead nucleated cousins these days. This entry was posted in World of Pearls and tagged bead nucleated, freshwater, freshwater pearls, peacock pearls, pearl, tahitian on February 22, 2015 by WendyG. Winding down now, most of the pearls we wanted have been found. It’s been a good trip, Successful, with beautiful pearls. I think that everything which could be metallic is metallic. I’m already thinking up designs and work plans for one-off silver and goldsmithing. Time for some reflections. There is still something of a shortage of medium sized natual colour and black rounds, drops and buttons for earrings with metallic lustre and good colour. Many of the pearls are washed out in colour. There are very few souffles around. There were some strands and loose at the main souffle supplier but they were light and ho-hum in colour, allbeit with good lustre. I wonder if production is tailing off, reflecting falling demand. At the same time another supplier seems to have been trying to produce something similar – what were described to me as baroque bead nucleated pearls looked like souffles rather than regular baroques. They had a bead ( you could hear it rattling in some) but at the same time there was a dark brown organic stuff inside each pearl between bead and nacre. It was a dried out flaky substance. No information forthcoming on how the pearls were produced. Bead nucleated is very much the thing. Solid nacre is almost becoming the exception. If you are wanting a sold nacre freshwater ‘classic’ white strand my advice would be to get it soon because solid nacre is going to get rarer – ask yourself….if you can produce round pearls with a bead and know most of your production will be round and at least AA wouldn’t you opt for that rather than hoping that the miracle of round and perfect AAA? There are more and more bead nucleated natural colours and white big round pearls with smooth surfaces and great lustre. Prices are plummeting with most suppliers. At the same time there are lots of very pallid ones out there. Mostly I don’t get them, but some had a blue/silver overtone and I’ll call them moonlight pearls. If you go for cool colours these may be the ripples for you. From a personal business viewpoint, the main impression which has struck me is the difference in attitude to their customers between the big companies and the smaller ones. The big ones aren’t really interested in small companies and don’t want to deal with us – that was made very clear when four of us were left in the hands of an employee who had worked for the company for a week only while every other member of staff looked on. I’ll not be even looking at their stock in future And another big player had sacks of real rubbish and year old low end stock alongside their top grade freshwaters. There the folk who deal with us regularly are delightful but the managers are sour faced and never even look at you. Conversely, the smaller suppliers have the same stock, often cheaper, and know me and are pleased to see me. We compare photos of grandchildren and discuss all manner of issues (well, mostly pearl issues) Where would you go? If you can’t be bothered to be pleasant why should I give you my money? This entry was posted in Pearlescencery and tagged beautiful pearls, pearl, pearls on September 15, 2014 by WendyG. A busy day again, full of pearl finding. I picked up where I left off, working through the wants list of loose single and pairs. It took more than an hour to find ten perfect pairs of AAA white mirror metallic pearls. It is staggering how many variations are possible in what should be a simple task – after all, how much variety can there be? Well the answer, of course, is zillions. For perfect pairs the size, colour, overtone, lustre and mirror size and quality must all match perfectly. Of course that is perfection. Later in the day Betty Sue King and I were sadly contemplating some big round bead nucleated ‘pairs’ most of which were sort of maybe something like. 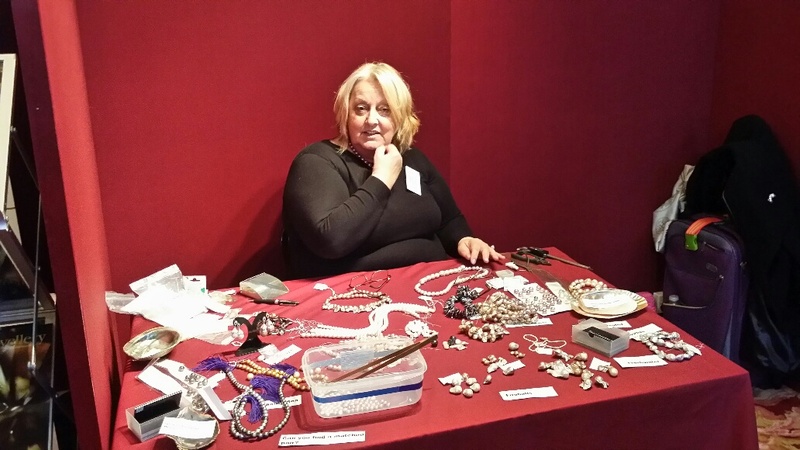 Betty Sue is a leading American pearl supplier with a lifetime of knowledge and skill in the pearl world. I just sit there learning when she is in the room. Before that though one of the highlights was a collection of nuggety ice cream coloured 10mmish undrilled mirror metallics. Not sure what I will do with them, but at the moment I’m thinking some pretty and feminine station bracelets with silver chain. Once I had paid for the pearls at the morning supplier I moved on to a second. Poking around the shelves, I pounced on some big and colourful bead nucleated baroques. Some of them huge -30mm and more. They were bead nukes gone a bit wonky. The wholesale staff member and I both gasped. You can see how how big the pearl is. There are a couple of fairly big flaws but ..oh that colour! 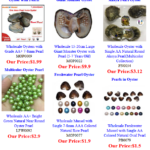 This entry was posted in Pearlescencery and tagged bead nucleated pearls, blue pearls, buying pearls, edison pearls, finding pearls, Ming pearls, pearl, pearls on September 8, 2014 by WendyG. It must be nearly two years ago now that we supplied a simple white pearl anklet to Michelle Keegan’s stylist for a photoshoot with a holiday look. Michelle is leaving top UK soap Coronation Street in May. It was her enthusiasm for this anklet which triggered the making of the whole Beach Collection – which she named. Beach Collection items are specifically designed to be all the jewellery you need to take on holiday. Either simple pearls or pearls on leather. And they look great on men or women. added March 30…The anklet is still sending postcards – Today’s Star Sunday calls it ‘delicate’ ! This entry was posted in Pearlescencery and tagged anklet, michelle keegan, pearl, pearls, white on March 8, 2014 by WendyG. I have a regular customer/correspondant, Andrew. He teaches classes in Rasa Shastra -making medicines using, amongst other things, powdered pearls. Which is where Pearlescence comes in, obviously. We supply him regularly with both pearl powder from drilling and whole pearls for crushing. Now a week or so ago I got an excited email from Andrew while he was in Japan, up near Kyoto. Would I be interested in some pearls which apparently were genuine Lake Biwa pearls. Lake Biwa was the centre of the Japanese freshwater pearl industry almost 100 years ago but the farms closed as the lake got hopelessly polluted, too dirty for its own species of freshwater mussel to survive. Andrew had found the proverbial little old shop which, in a dusty corner, had some pearls which were said to be genuine Biwas. recently the term Biwa has been slapped onto stick pearls. Stick pearls were produced but mainly production was of small, lustrous freeform pearls. Now these pearls have a slighly silky lustre. Andrew could get no clear paperwork provenance, but these certainly don’t have the look of Chinese freshwaters or of European river pearls. Their lustre is noticeably silky and they have a very clean surface, albeit not particularly regular. Sizes range between 6mm (not many) down to 1mm. they’re white with a rainbow orient. Now please note I am not saying for certain that these are Biwa pearls, just that there is a strong likelihood. This entry was posted in Pearlescencery and tagged biwa, lake Biwa, pearl, pearls on January 7, 2014 by WendyG. So, we’re about half way now in getting sorted, catalogued. processed, made, into stock, photographed and uploaded all the pearl delights which I brought back from Hong Kong and the Gem Show..is it really two weeks ago now? The time has passed in a haze and daze of sorting through bags and bags and piles of pearls, knotting necklaces, and uploading loose strands. Now we’re as far as drilling some of the undrilled to make earrings etc. Yesterday I sat at my workbench and went through about ten cards of pairs, working out exactly where to drill them – sometimes it’s easy to figure, as an otherwise perfect pearl has a nobble or dent in just one place,. That’s where you drill, to hide the flaw in the hole and under a finding, hopefully. But some pearls have a sort of smeary patch and deciding just where to drill is then a bit more problematic. In any case, I mark all pearls with a black dot – it makes lining up the drill bit exactly correctly much easier. So this is how the drill area looked first thing. There are also some fabulous metallic white drops and some white ‘splatts’ flattish pearls shaped a bit like ink blots which will be earrings and cufflinks. Plus some absolutely fabulous huge gold leaf ripple drops for pendants and earrings – and some frilly fireballs. Since these are all top quality pearls I usually change the drill bit after 10 pearls because they go blunt very quickly and I usually drill quite a deep half drill. It give the glue/air pocket at the end some space so that the finding doesn’t bounce out when you put it down and leave it to dry. The first time I ever drilled some pearls I did them to the exact depth of the pin and when I came back to check them after leaving them to dry every single one had risen about 1mm out of the holes. You only learn by doing! This entry was posted in Pearlescencery and tagged buying pearls, pearl, pearl website, sorting new stock, uploading pearls on September 28, 2013 by WendyG. It’s a good feeling to get to the Gem Fair finally knowing that just about all the shopping is actually done and I can spend the time pottering around and picking up the odd strand or pearl here and there. Thanks to Jeremy and Hisano Shepherd of Pearl Paradise.com I’ve ventured back into Akoya territory after some years, with the purchase of some beautiful natural multicoloured strands. The hugepearl hall itself seemed very quiet, not many there. 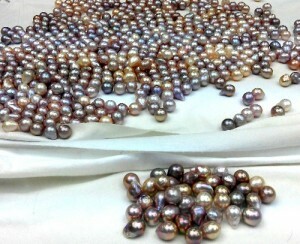 It could be that many would be pearl buyers were buying elsewhere or that the recession is still affecting buying. 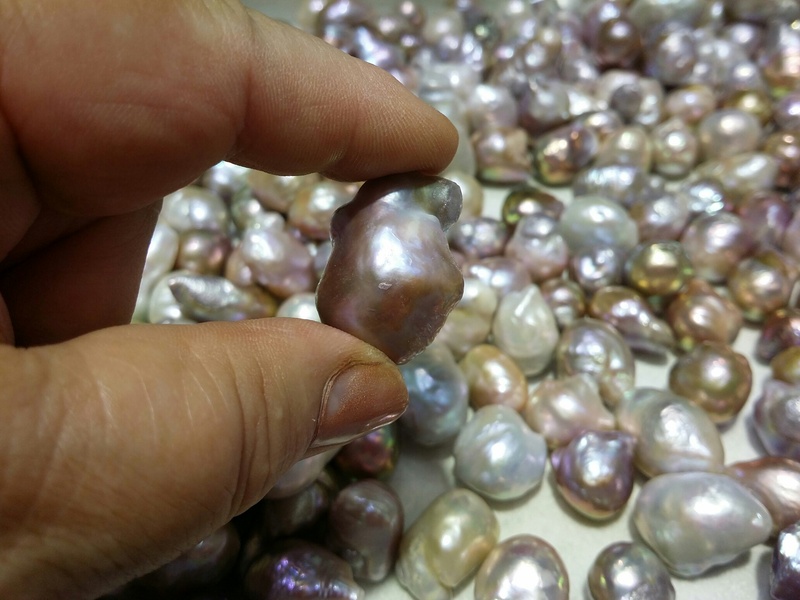 Jeremy and Hisano were replenishing their Tahitian and South Sea stock so I got to meet lots of lovely pearls, including the carved Tahitians produced by Galatea pearls. carves intricate and beautiful designs into the nacre of Tahitian pearls. Some of the pearls are even nucleated with gemstones which are revealed once the carving is done – a bit like like the look of a cameo. I got to ask the man himself something I have wondered since I first heard about carved pearls – namely does the carved nacre peel and chip easily. No it doesn’t. Kevin Canning of Pearls of Joy was also there- first time at the show and already happily clutching big bags of Tahitians. My final purchase? Not exciting at all. Strands of 6mm potato pearls which were needed but which I kept forgetting all week. Job done and a bit pearl shopped out. This entry was posted in Pearlescencery and tagged galatea pearls, hong kong gem show, pearl on September 12, 2013 by WendyG. Day one, and every pearl today is metallic. 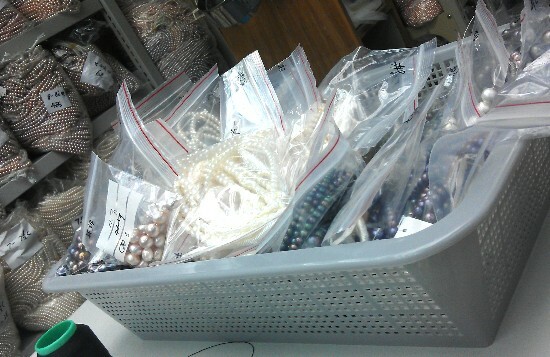 I’ve spent about six hours in one wholesaler’s office today and found some stunning pearls, all metallic, every single one. White AAA round metallics, colourful aaa black rounds which are, of course, anything but black (gold, pink, green, blue, aubergine) as well as drips and buttons for earrings: plus some weird shapes which will be…I have no idea! The first general market news is that small pearls have shot up in price due to a production emphasis on bigger and bigger pearls. There seem to be a few more natural colours pearls around, although this wholesaler still hadn’t got any big half drilled drops and the big buttons were mostly orangy peach (pass). 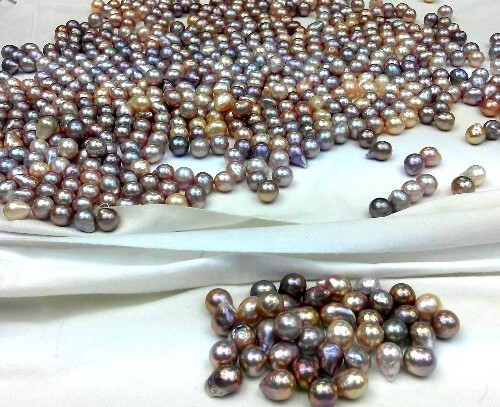 Many of the white pearls ae creamier in colour than before – noticeably so. And I found some pretty nominally white strands where the pearls were just a slightly different shade. Really pretty. Plus some weird shapes which I will…I have no idea what I will do with them at the moment but they are mirror metallic natural colours. What’s not to take home? Metallic freshwater freeform pearls – amazing depth of colour and shine. I had a list, and occasionally I remembered it and got some of the pearls on the list, but for much of the time I kept finding great pearls, and who can resist great pearls? So this was my day one basket. This entry was posted in Pearlescencery and tagged hong kongFirst, metallic, pearl, tahtian on September 4, 2013 by WendyG.